OPEN FROM noon TO 4:00 P.M. 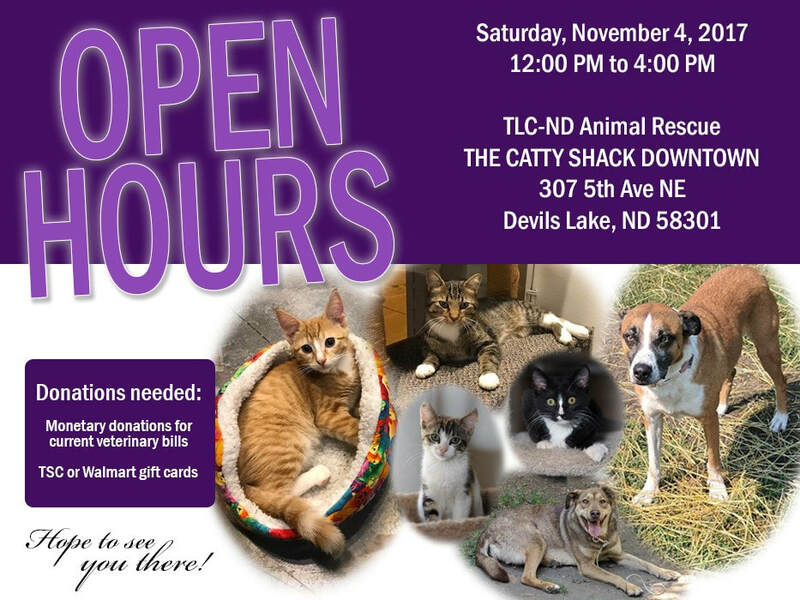 Choose ‘TLC Animal Rescue Rae Roseland’ and click ‘ACCEPT MY HOST’ (don’t worry that it says Moorhead, MN – that is where Rae is located). One of the most important parts of Devils Lake Lakes Liquor initiative is the "Cheers to Community" wines and beer that we feature every month. These wines and beer represent a simple way for you to support a non-profit organization in and around the Devils Lake Lakes Region. Each month, we’ll pick one wine or beer to promote all month. At the end of the month, 10% of the sales of the wine or beer... will go back to our designated partner – the more you drink, the more we donate! This month we’re featuring SELENI (Pinot Noir) an easy-drinking, affordable wine, and sending our donation to TLC-ND ANIMAL RESCUE, they're an animal rescue group based out of Devils Lake, ND that is DEDICATED to helping animals in need and finding them FUR-EVER homes and has been part of our Devils Lakes Community since 2010. Please “Like” and “Share” this post on your page and support this great Nonprofit. Thank You!!! Unfortunately we have been informed this program is being discontinued as of April 30, 2019. It was a nice addition to our fundraising efforts while it lasted since so many of you order regularly. campaign number. Or easier yet, just click on the 'Support This Campaign' button above! Then, if you normally order on a regular basis, we will still get 5% of food orders for an additional 90 days if you order using our campaign number. You would just need to order it ahead and your order will be delivered on your existing scheduled route day. The pumpkins we have remaining will be at the rummage sale. We are partnering with Yankee Candle Fundraising to help achieve our goals this year – 40% of every sale goes to us! Visit www.yankeecandlefundraising.com and enter Group Number 999969305 in the “Start Shopping” box. The Seller ID is optional, but please enter the ID if provided by your seller. 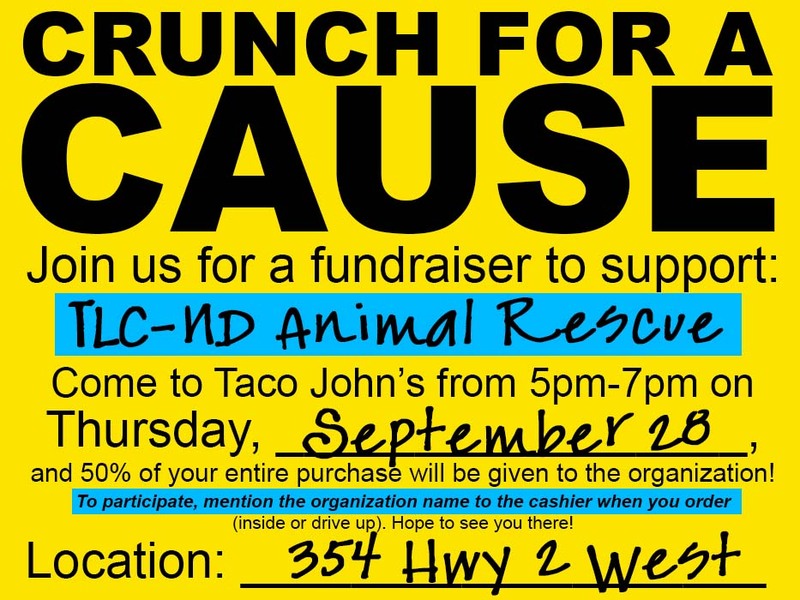 Please be sure the Group Name says “TLC-ND Animal Rescue” or we will not benefit from your order. Then shop for catalog items and online exclusives to help us reach our goal. Shipping is $7.99 for orders up to $999.99 and 6% of order total for orders over $100.00, so order with friends or a group to save shipping! SAVE THE DATE (AND YOUR STUFF)! like to donate they can be brought to the Peterson building on FRIDAY, JULY 6. 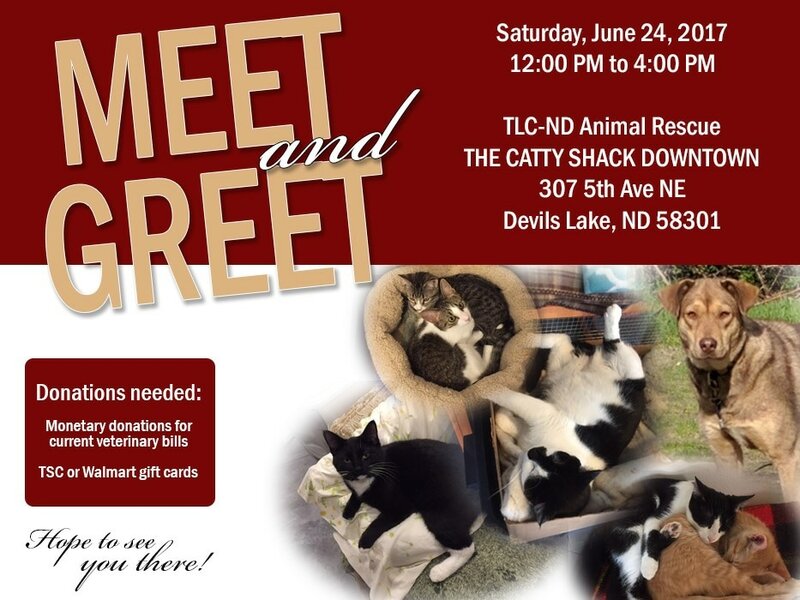 Exact time to be determined by July 5.
and Amazon donates to TLC-ND Animal Rescue. on your phone and present it to your server. That is the only way we get credit for your order. *Food and non-alcoholic beverages are included; alcoholic beverages, tax and tip are NOT included. 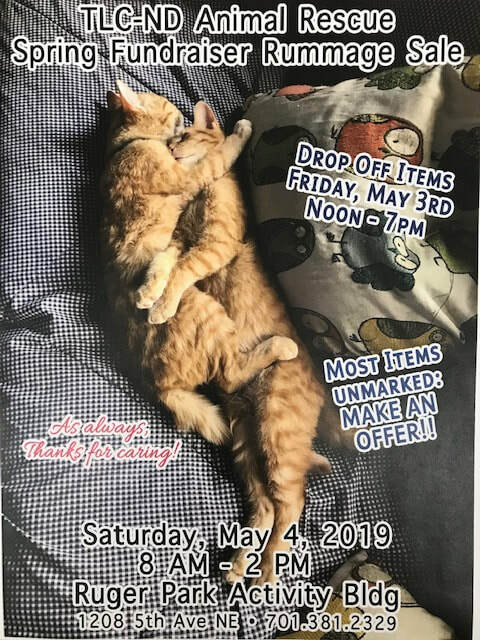 please consider donating your items to the rummage sale. and The Catty Shack Downtown. You can also call 701.662.4357 (HELP) if you would like to order. Please leave a message and someone will get back to you! CHECK OUT THE CLEARANCE, WRAPPING PAPER AND GARDEN ITEMS! Fundraiser has been extended to July 12! Shipping is only $5.99 for orders up to $100.00 and free for orders over $100.00, so order together with friends! 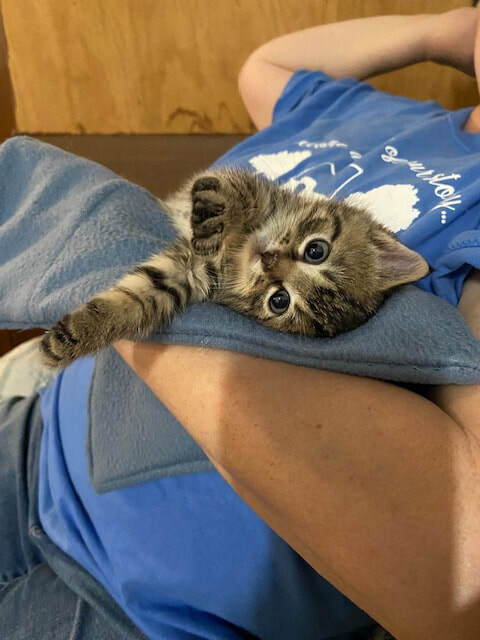 If you need help to order online, please contact TLC-ND Animal Rescue at 662-4357 and we will put you in touch with a seller! like to donate they can be brought to the Peterson building on FRIDAY, JULY 7. We will be at Tractor Supply Company in Devils Lake, ND. 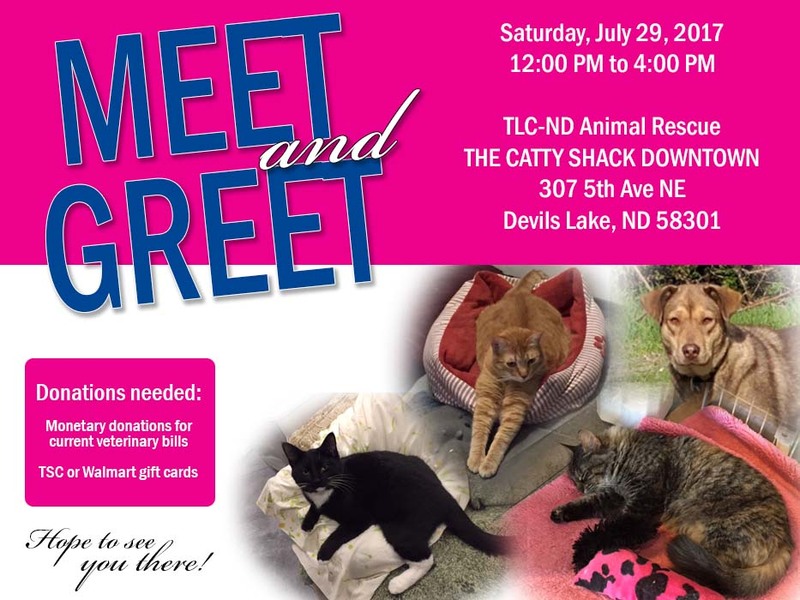 Stop by and meet the animals. Ask how you can become a foster parent. Fosters are always needed. Donations are gratefully accepted.